Nicolaus Copernicus (1473-1543) - Copernicus is often considered the scientist who helped bring humanity out of the Middle Ages and set the world on the path of scientific investigation and discovery. His proposal of a heliocentric model of the universe (in which the planets revolve around the sun) was a radical shift from the accepted geocentric one (in which the planets revolve around the earth) which predominated at the time. He published his theory (at the time it was still a theory) in De revolutionibus orbium coelstium (On the Revolutions of the Celestial Spheres) just before his death in 1543. The reason he waited until the end of his life is because he feared the Catholic Church would denounce it as heresy (as happened to Galileo). 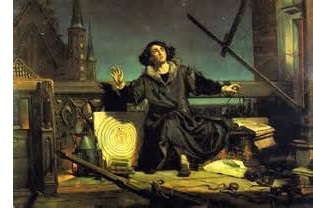 His private writings indicate that he began to formulate heliocentric model as early as 1514. In actuality, his publication went largely unnoticed by the Church, immediately following his death, and did not come under heavy scrutiny until Galileo's troubles began. This is considered the start of the Scientific Revolution which led to numerous scientific discoveries of the Early Modern Period (following the Renaissance). If you look at his place on the history chart, you see that he is first of the great scientists of the Early Modern period, which includes Kepler, Galileo and ultimately Isaac Newton. Copernicus' nationality is the subject of fierce debate between Germany and Poland. He was born in the Kingdom of Poland in the western region of Royal Prussia at a time when borders were not well-defined; and both countries claim him as their own. He was known to speak Polish, German, Italian, Latin and Greek. Regardless of his nationality, he's just too important to leave off this chart and is German enough to stick on its timeline.